Making space for what matters is more than a minimalist strategy on decluttering your life. I’m challenging myself to build this idea into my schedule & goals for the year ahead. Space isn’t just about things, it’s really about your life, and what it’s made up of. 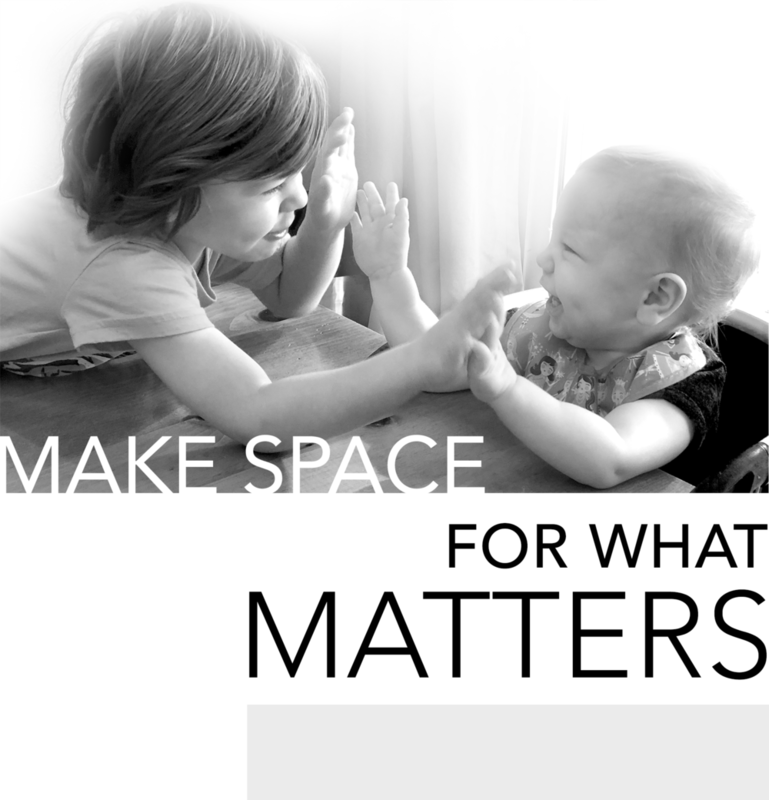 For my two young babies, it means space to play, create and run around. More space for me results in time to sit with them, undistracted and able to enjoy their chatter, laughter and countless questions. As a designer, I was taught that “clear space” can be just as significant as content. Building in margin and breathing room allows attention to be directed to the areas that matter. Really evaluate all the pieces of the layout–why are they there, what purpose do they have? Are they serving the main point? This idea of margin and space has been on my mind as I journey through minimalism; pairing down my life to what really matters. My whole life I’ve struggled to let go of things, convinced that I will always have use for pretty odds and ends. And as an artist, I’m skilled at creating…so why not hold on to old cards, fabric, clothes, etc. I didn’t want to admit that this stuff was really holding me down, and holding me back from accomplishing my purpose. Over the last year, I have enjoyed the challenge of getting rid of things–extra stuff–so that my life felt clearer and freed up. Decluttering my house made me feel at peace and in control of my life. Minimalist mother of four, Allie Cassazza, has been a life-changing resource and inspiration for me. I never knew I could live the life I always wanted: free of guilt, burden, and STUFF that was just getting in my way. Now that I have less to take care of and clean up after, I have been able to start my design business. And with two little ones, that is no small accomplishment. Space, breathing room, margin–whatever you want to call it, don’t underestimate its power to give your life freedom. It takes diligence to pursue, but I’m looking forward to reaping its benefits even more in the seasons ahead.